One of my favorite parts of each day is when i happen upon an inspiring fabric-ie project that someone made using their creativity, imagination, unique perspective, talents and their two hands. 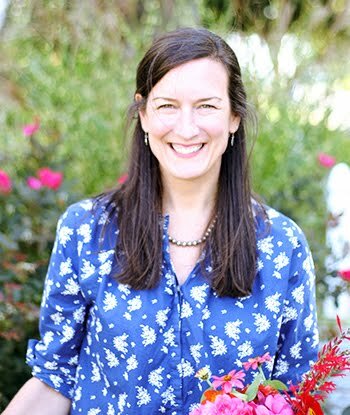 Sometimes the projects might even include fabrics i've designed for Moda Fabrics...and let me say that the excitement i feel when i discover your beautiful work does not get old! 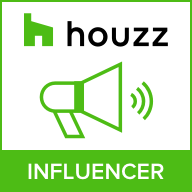 It's an immeasurable joy for me and if i've left a comment on your blog that's maybe verging on "gush-ie", i'm sorry but i just can't help it. If i've missed finding/seeing any of your projects and you'd like to share, please consider doing so on my Facebook page. I'll definitely see it there — and will probably gush over it! 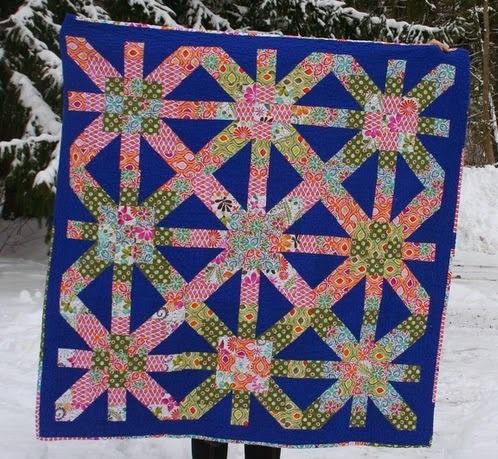 A few recent highlights included seeing a free quilt pattern using Daydream (shipping now), a beautiful window display Joyce put together with all sorts of projects using Sunnyside, a cute quilt on Etsy using mixed-lines, as well as quilts made with Joy and my next winter line, Solstice. 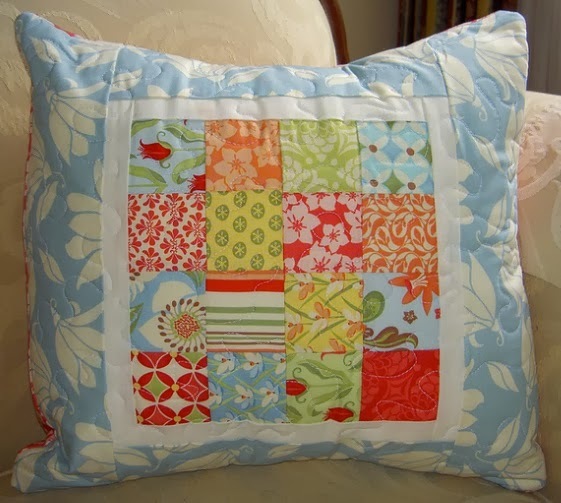 Meredith F. made this delightful decorative pillow using Verna. Paisley Crazy made this “Senior Year” Quilt for her daughter in college using the “CharmingStars” pattern, designed by Stefanie Roman of Little LadyPatchwork, and fabrics from Fandango. 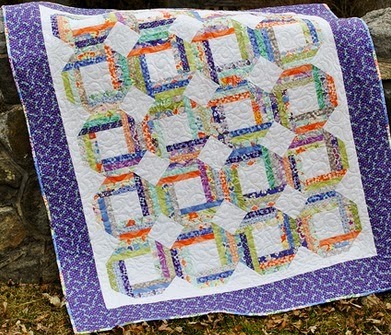 Gretchen of Stella Bella Quilts created this Schnibbles quilt using the “Four Corners” pattern by Miss Rosie’s Quilt Co. and fabrics from Central Park. Misa Martin made this Supernova quilt using fabrics from Terrain. 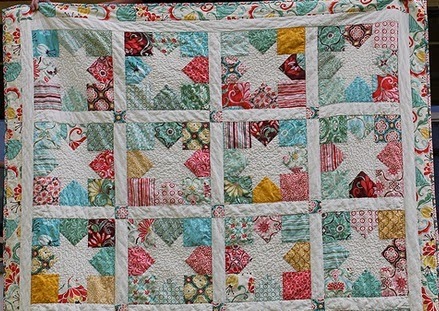 Sue Pfau of Sweet Jane’s Quilting created this quilt using the “Journey” pattern by Sweet Jane’s and fabrics from Good Fortune. We get lots of emails from people hoping we might know where they can still find cuts from some of these lines and much of the time we have no idea...until now. We've decided to start stocking limited-edition-specially-selected bundles of out-of-print lines in our online shop. 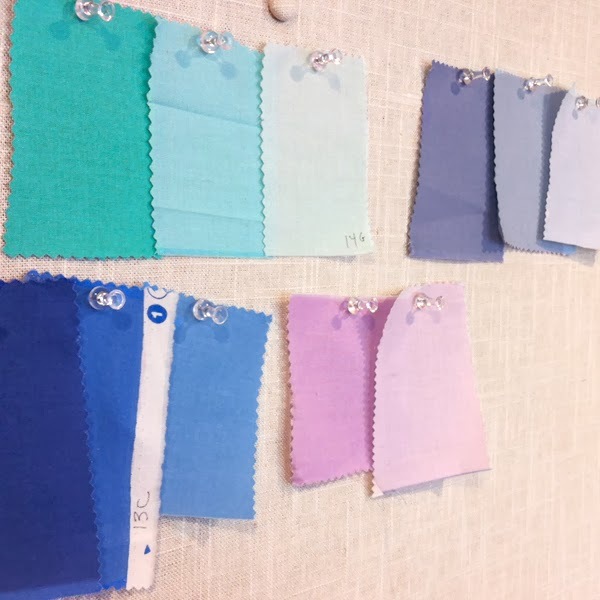 What we'd like to know from you is: which fabric line would you like us to stock next? Please click here to take a quick survey to let us know your favorites. We appreciate your help so much. 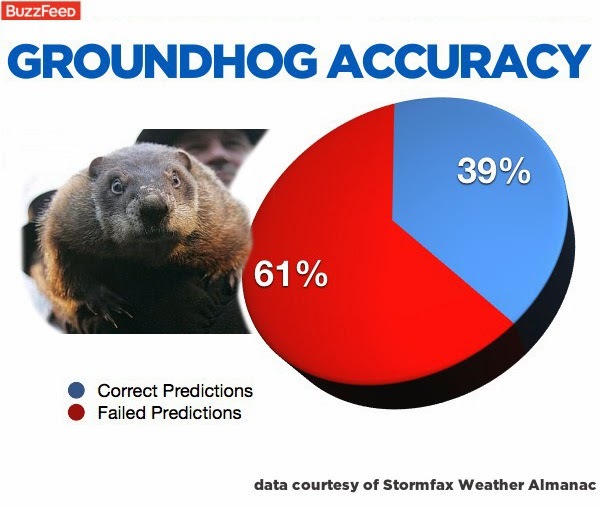 Happy Chinese New Year … and Happy Superbowl-Groundhog Sunday! This weekend, we’ll be galloping into the Chinese New Year — The Year of the Horse — and making wagers on spring’s arrival through the groggy eyes of a prognostically challenged groundhog! Depending on which groundhog webcam you watch, (don’t miss this little guy’s crib in Nova Scotia) spring is supposed to arrive (somewhere) in 7 weeks. Shall we begin the countdown now? On the same day the season's fate is in Punxatawny's paws, American football enthusiasts will be awaiting the fate of their favorite team in the Superbowl. Seahawks fans, beware, pop cosmology isn’t on your side this game! I admit i'm not a huge football fan, but the Superbowl always seems to be a marker of the near-end of one season and the almost-beginning of another (no matter what Punxatawny says). The light around here has already started to shift and the days are a teenie bit longer. Yay! 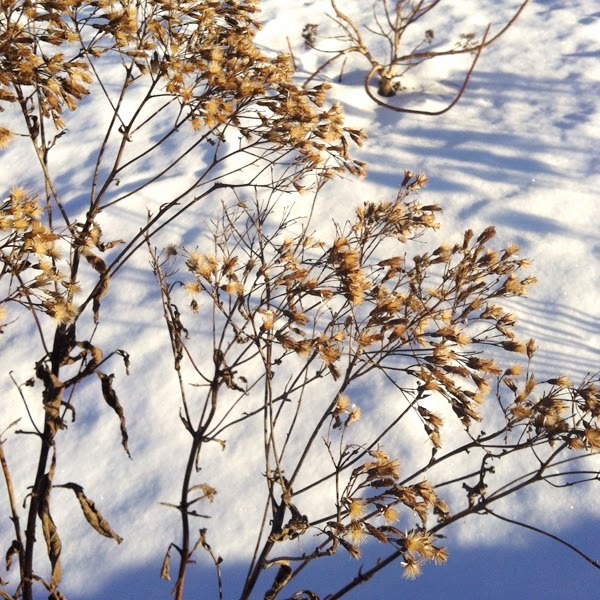 But it's been so cold that none of the snow has melted in our slumbering garden. 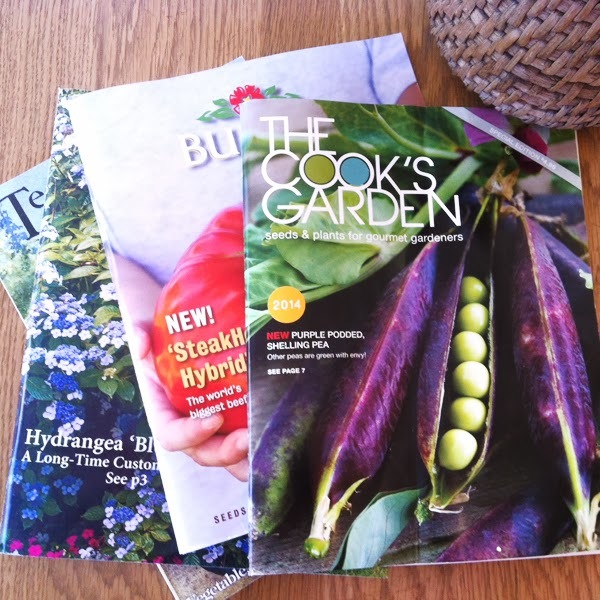 That's ok because lots of colorful flower-filled seed catalogs have been arriving in our mailbox over the past couple weeks and i've been piling them up for just the right quiet time to dream of warmth and to plot out some ideas for spring planting and gardening. Regardless, no time like the present. 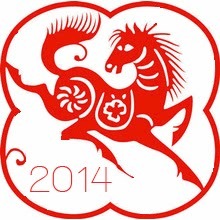 I hope you all have a smooth, adventurous ride this Year of the Horse — with good health, nurturing friendships, and swift strides toward your dreams. Woah, horsey! Almost forgot...Daydream yardage should be shipping soon! Please post and share photos of anything you make with this collection (or any collection!) on my Facebook page. Your creativity and talents bring me so much happiness no matter what the season.